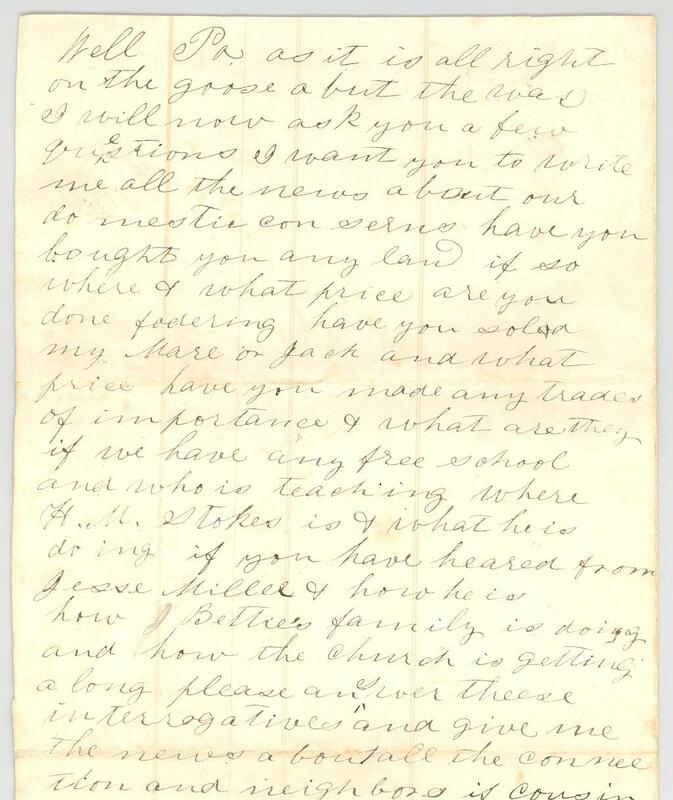 Item description: Letter, 22 September 1862, from Andrew J. Proffit, private in Company D, 18th Regiment N.C. 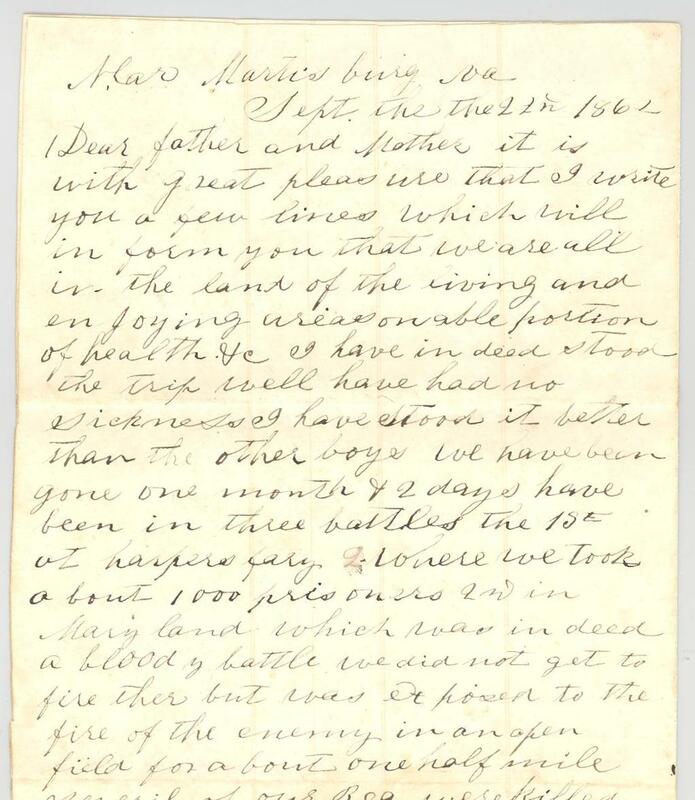 Troops to his parents in Lewis Fork, Wilkes County, N.C.
Andrew J. Proffit and his brother Alfred were conscripted into the Confederate Army in August 1862. Shortly after joining the 18th North Carolina, Andrew was involved in the fall of Harper’s Ferry on 14 September, the Battle of Antietam on 17 September, and the Battle of Shepherdstown. Item citation: From the Proffit Family Letters, #3408-z, Southern Historical Collection, The Wilson Library, University of North Carolina at Chapel Hill. It is with great pleasure that I write you a few lines which will inform you that we are in the land of the living and enjoying reasonable position of health etc. I have indeed stood the trip well and have no sickness. I have stood it better than the other boys. We have been gone one month & 2 days & have been in the battle the 15h at Harpers Ferry where where we took about 1000 Prisoners in Maryland which was indeed a bloody battle. 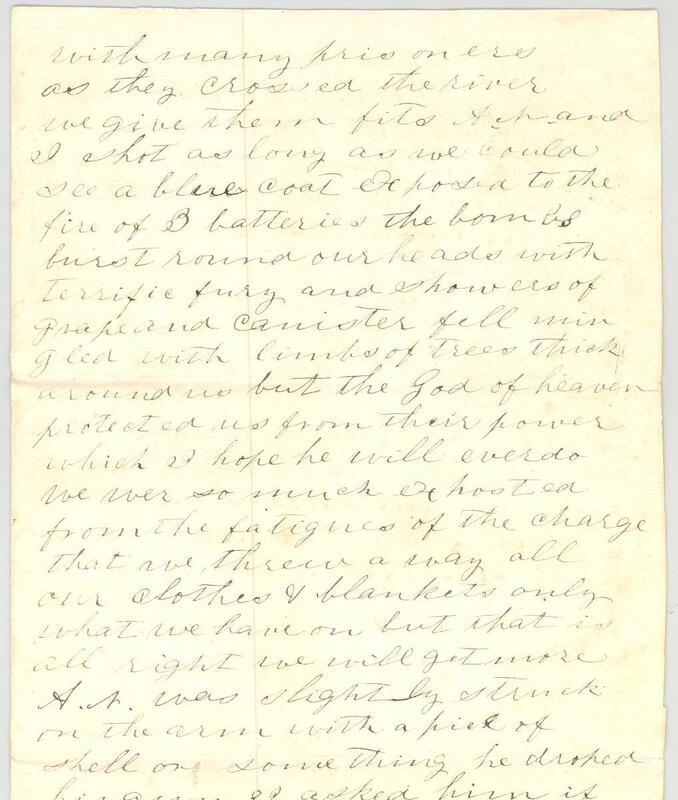 We did not get to fire there but was exposed to the fire of the enemy in an open field for about one half mile. Severil of our Reg were killed and Wouned. We lay all day next day behind a fense exposed to their sharp shooters & A.W. Dunkin was shot through the thigh. That night we crossed back to va. We formed in line of battle about one mile from them and made a generil charge, exposed the whole way to the heaviest bombing said to be by old soldiers that they ever saw but we routed them and drove them back across the river about 9 or 10 oclock. I suppose we lost a great many but the yankees lay on the field in heaps and piles. We got all their arms, knapsacks, and all they had with many prisoners as they crossed the river. We give them fits and I shot as long as we could see blue coat. Exposed to the fire of 3 batteries the bombs burst round our head with terrific fury and showers of grape and canister fell mingled with limbs of trees thick around us, but he God of heaven protected us from their power which I hope he will ever do. We were much exhousted from the fatigues of the charge that we threw away our clothes & blankits only what we have on but that is all right. We will get more. A.N. [his brother Alfred Newton Profit] was slightly struck on the arm with a piece of shell or something. He dropped his gun. I asked him if he was hurt. He said not. He grabbed his and fought like a heroe while the sweat dropped fast from his brow. T.G. Walsh, A. Vannoy, John Ferguson, R.M. 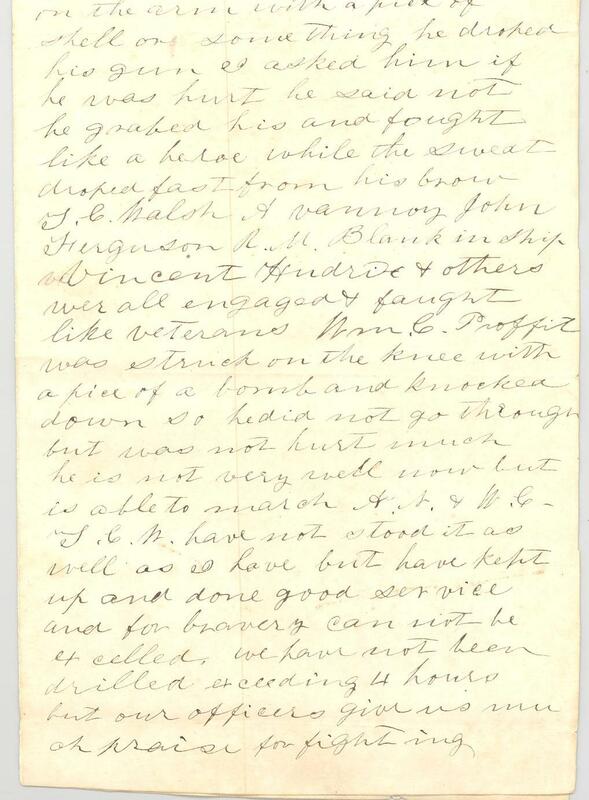 Blankinship, Vincent Hindrix & others were engaged and fought like veterans. Wm. C. Proffit was struck on the knee with a piece of a bomb and knocked down so he did not go through but was not hurt much. He is not very well now but A.N & W. C. Have not stood it as well as I have but have kept up and done good service and for bravery can not be excelled. We have not been drilled exceeding 4 hours but our officers give us much praise for fighting. Well Pa as it is all right on the goose about the war, I will now ask you a few questions. I want you to write me all the news about our domestic consensus. Have you bought you any land if so where & what price? Are you done fodering? Have you sold my Mare or Jack and what price? Have you made any trades of importance & what are they? DO we have any free school and who is teaching? Where is H.M. Stokes & what is he doing. If you have heard from Jesse Mills & how he is & how J. Betties family is doing and how the church is getting along. Pleas answer these interrogations and give me the news about the connection and neighbors and if cousin fanny got well. Write if you have heard from harriston lately. he was broken down and not able to travel when his Reg left the Rhapadan and he was sent back to Gordonsville or Orange Ct. to rest. I saw some of his reg yesterday. I thought that William Walsh was gone home when I wrote before but he did not start then but I suppose he has or will go soon for he will not be retained in service. Tell H. Binghams connection that I see him almost every day. He is in our brigade & is doing well. 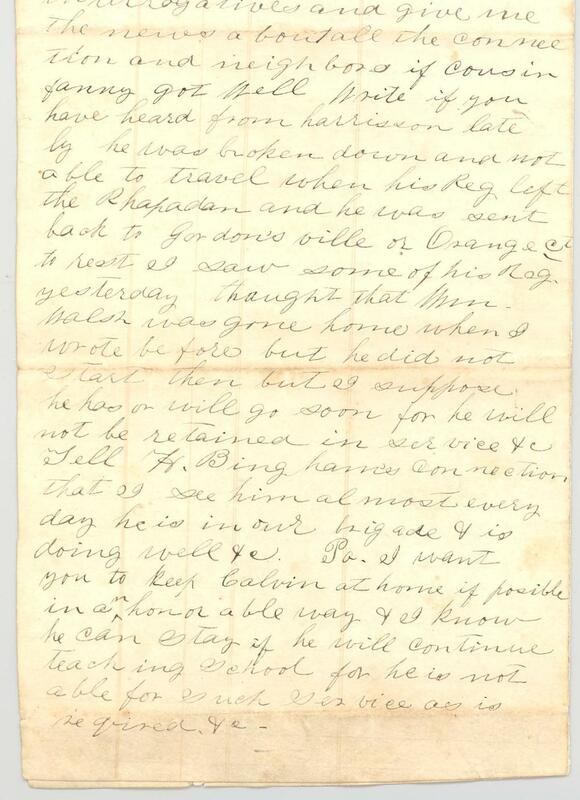 Pa – I want you to keep Calvin at home if possible in an honorable way. I know he will stay if he will continue to teach school for he is not able for such service as is required. I believe I have written about all I know. I am anxious to hear from you & to know what you are going to do about at home. I know not what plan to suggest if you could get that set of mules I would be much pleased, if not, I think you could do well on Gap Creek. If you get a good chance you must do the best you can. Sell any of my property and apply it to the most needful purpose. Write whether Capt Ball took my wagons or not and take it all in. Get some man to write a day for you and write everything that will be of interest to me. Tell all my friends to write often to me & I will write to them but my chance is bad. I have to send them to Gordonsville to be mailed which is about 150 or 200 miles. There fore if you do not get many letters from us you need not be uneasy. When you write direct this in writing thus they will follow me where I am “A.J. Proffit, 18th Reg. 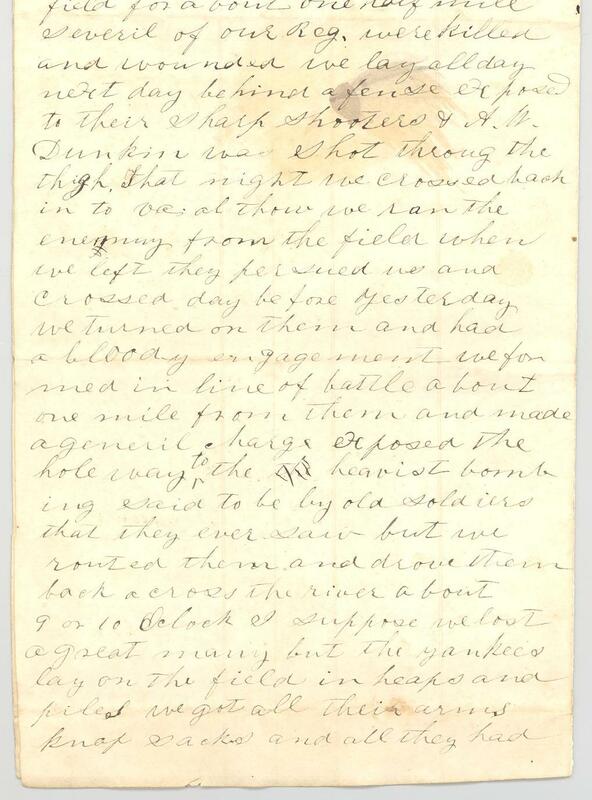 NC Troops, Branch’s Brigade, A.P. 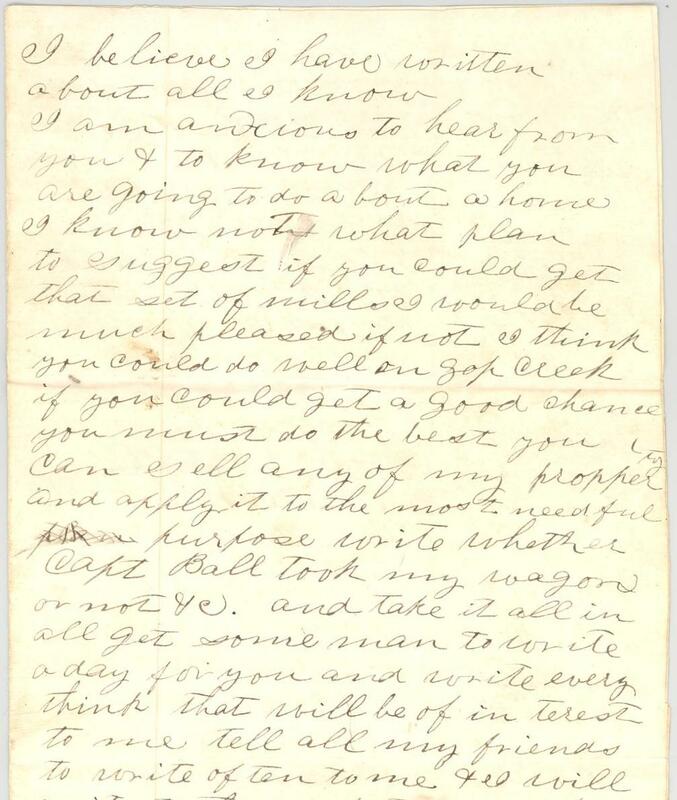 Hill’s division, Gordonsville va. Co. D.” I will now close close by subscribing my self you most obedient son till death, &c.
PS – Please inform my friends how to direct their letters, &c. A.J.P. 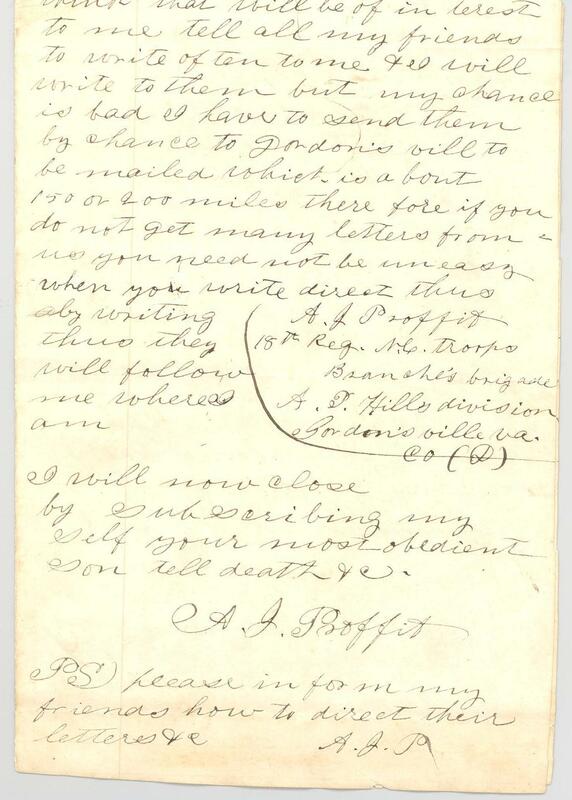 This entry was posted in Southern Historical Collection and tagged 18th Regiment North Carolina Troops, Andrew J. Proffit, Harper's Ferry, Maryland Campaign, North Carolina, Proffit family, Wilkes County. Bookmark the permalink.